Martin Robson – Martin is one of the UK and world’s most experienced and qualified Tec Diving Instructor Trainers. 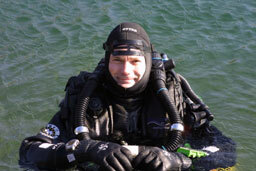 Martin teaches courses from PADI, IANTD, TDI and both of the major Cave Diver training agencies (NACD and NSS-CDS) and brings a wealth of experience and expertise. He regularly contributes to training manuals on all aspects of technical diving and has been published in magazines in the UK, USA, Scandinavia and Russia. Martin specialises in Rebreather and Overhead Environment training and he was the first ever IANTD CCR Cave Instructor Trainer. He has conducted substantial wreck and cave diving expeditions with major penetrations to depths over 180m. Martin is passionate about ensuring that all training is exciting, enjoyable and the very best in diver education. “Martin Robson is one of the most outstanding cave instructors I have ever dived with, a fantastic instructor, diver and friend.” Tom Mount.